These are not our own words, but those of the press and our audiences. It is something that we are very proud of. Clearly, through our passion for quality, innovation and adventure, we manage to succeed in touching the hearts of those that listen to us. What characterizes our ensemble is its surprising repertoire, the great joy we have in playing together and the multidisciplinary nature of many of our programs. The ensemble exists almost 30 years. In those years we have recorded nine well-received cd’s, with a cross-section of beautiful chamber music written for wind instruments and the piano. The ensemble has also made concert tours to the United States, Russia (including the Republic of Bashkortostan), Germany, France, Italy, Belgium, Slovenia and the United Kingdom. No musical archive is safe for the six members of the Hexagon Ensemble. They look all over the world for little known or forgotten repertoire. During this quest they have amassed a unique catalogue that includes over 4000 works: little known works from famous composers, but also pieces by unknown composers. This idiosyncratic approach is also clearly apparent in the many CD’s that the ensemble has recorded. The ensemble has also rearranged Rossini’s opera La Cenerentola for ensemble and actor/singer. 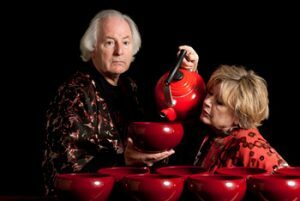 This program – aimed at both young and older audiences – was performed with actor Joep Onderdelinden as narrator and singer. From 2013 onwards, the program The Imagination was performed in concert halls, museums and theaters. For this program, amateur painters made works inspired by Modest Mussorgsky’s Pictures At An Exhibition. During the Hexagon Ensemble’s performance of this world-renowned piece, the works are projected above the ensemble. The result is a powerful bridge between music and the visual arts. An intense passion and love for chamber music is what binds the musicians of the Hexagon Ensemble. We make pronounced choices from the classical, twentieth century and contemporary repertoire for wind instruments and piano. We arrange these into surprising programs in which we weave together both tradition and innovation, including contemporary arrangements of older pieces. Our waywardness and versatility go hand in hand with our drive to explore and stretch across traditional artistic boundaries. This curiosité permanente is expressed through the extensive set of adventurous connections we have made with other styles of music and performing arts, such as dance, theatre, literature and the visual arts. To perform music at the very highest level is a continuous and enjoyable goal to the Hexagon Ensemble. We want to continue to prove our top position at the national level and expand internationally. We also aspire to deepen our artistic quality and broaden it by initiating new, innovative cooperations and (co)producing striking cross-over programs. Last but not least, we want to continue to expand our own unique repertoire and adapt our programs even more successfully to a broad audience, ranging from seasoned listeners to newcomers in the world of chamber music. 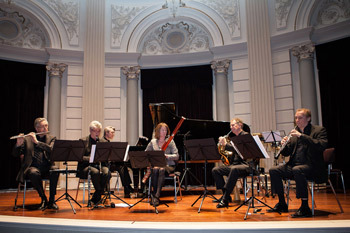 Since 1991 the ensemble has had many successful performances, including at leading concert halls such as The Concertgebouw in Amsterdam, De Doelen in Rotterdam and Wigmore Hall in London. The Hexagon Ensemble made a tour to the United States, which included concerts as well as masterclasses. Other tours brought the ensemble to Slovenia, France and Italy. 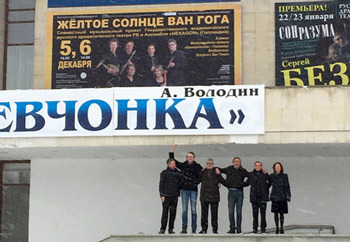 In 2014, 2015 and 2017 the Hexagon Ensemble had three very successful tours to Russia, including the Republic of Bashkortostan where it was ‘ensemble in residence’ at the Ufa Arts Festival.